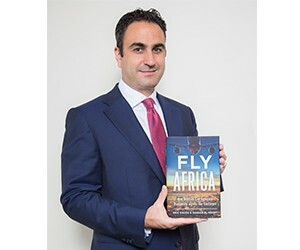 FLY AFRICA, a book authored by Hassan El-Houry, a pioneer in the African aviation in­dustry and Eric Kacou, an African strategist and investor, was launched yesterday on Amazon. The book highlights how aviation could become one of Africa’s greatest strengths, underpinning its economic growth and connecting it with the rest of the world. Yet today, Africa’s aviation industry lags behind much of the world. This disparity is most evident in the fact that Africans make up 12% of the world’s population but less than 2% of its travelers. This discrepancy is not inevitable. Aviation can provide a lifeline to re­vitalize national economies throughout Africa and contribute to development. El-Houry said "We believe that the future of aviation lies in Africa. As the continent grows and economies continue to develop, we will see more and more opportunities for new business models to be born on the continent. Africa has much to learn, but it also has much to teach. With vision, cooperation, and commitment we believe Africa’s aviation potential will be fully realized." The authors have also mapped a route to transforming the continent’s aviation industry, highlighting its existing champions and illustrating the effects aviation can have on other sectors. The content of FLY AFRICA is based on solid research and combined with personal knowledge and experience, gathered from El-Houry’s role as Group CEO of National Aviation Services (NAS), the fastest growing aviation services provider in emerging markets. This makes FLY AFRICA an honest picture of the aviation industry in Africa and its great potential. Kacou said "The repercussions of a healthy aviation sector in Africa would be felt everywhere. It would mean more African tourists in Europe, more African businesspeople in the Middle East, and more African students in the United States. That in turn would portend a new relationship between Africa and the rest of the world. In this book, we aim to offer both a realistic appraisal of the current situation and an optimistic vision of what’s possible when we unleash the potential of aviation in Africa." All in all, FLY AFRICA is a must-read for anyone who believes in aviation in Africa. To order the book, visit www.Amazon.com. Distributed by APO Group on behalf of Fly Africa.